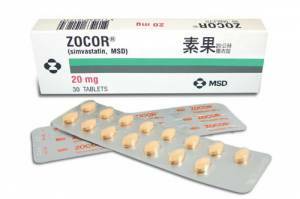 Zocor tablets contain the active ingredient simvastatin, which is a type of medicine called a statin. (NB. Simvastatin is also available without a brand name, ie as the generic medicine.) Simvastatin works by reducing the production of cholesterol by the liver. For the sake of simplicity, there are two sorts of cholesterol; a 'bad' sort called low density lipoprotein (LDL) and a 'good' sort called high density lipoprotein (HDL). LDL is deposited in the arteries and increases the risk of heart disease by clogging and narrowing the arteries (atherosclerosis), while HDL actually protects the arteries against this. Simvastatin decreases the production of LDL cholesterol by blocking the action of the enzyme in the liver (called HMG-CoA reductase) that is responsible for its production. This decreases the amount of cholesterol in the liver cells, which causes them to take up LDL cholesterol from the blood. The decreased cholesterol production and increased removal of LDL cholesterol from the blood ultimately results in lowered blood cholesterol levels. As the body produces most cholesterol at night, statins are generally more effective if taken at night. Simvastatin also causes a small decrease in the production of other 'bad fats' in the blood called triglycerides, and a small increase in the level of HDL cholesterol. This results in lowered levels of 'bad fats' and raised levels of 'good fats' in the blood. Statins have an important role in the prevention of coronary heart disease. They reduce the risk of excess cholesterol being deposited in the major blood vessels of the heart (atherosclerosis). Any blockage in the blood vessels limits the amount of blood and therefore oxygen being carried to the heart muscle. This can cause chest pain (angina) and in severe cases can result in a heart attack (myocardial infarction). Simvastatin is used to lower cholesterol in people who have high levels either due to genetics (familial hypercholesterolaemia) or as a result of diet and lifestyle. This helps to reduce the risk of atherosclerosis, angina and heart attacks (coronary heart disease). Simvastatin can also be used to reduce the risk of coronary heart disease in people who have already had a heart attack, or who suffer from angina or diabetes. In these people simvastatin slows down hardening of the arteries, regardless of your cholesterol level. It reduces the risk of needing procedures to improve blood supply to the heart, such as a balloon dilation of an artery or a heart bypass graft. It also reduces the risk of heart attack and death. It is important to continue to follow a cholesterol-lowering diet and exercise regime while taking simvastatin. Discuss this with your doctor.